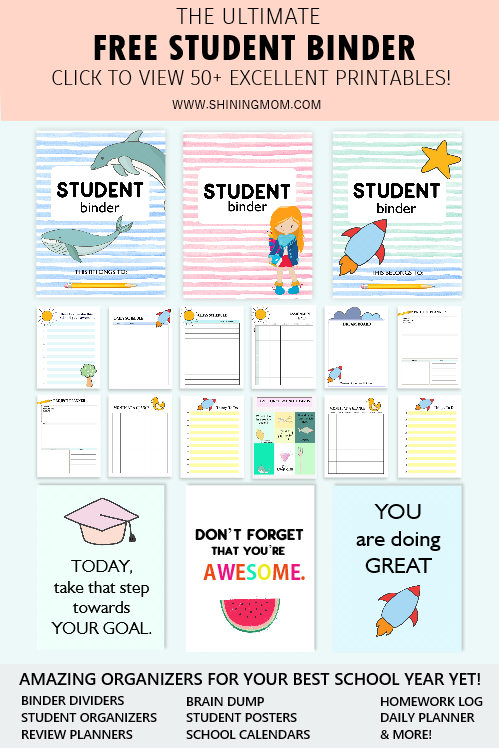 I’m just excited to publish my freebies for today. 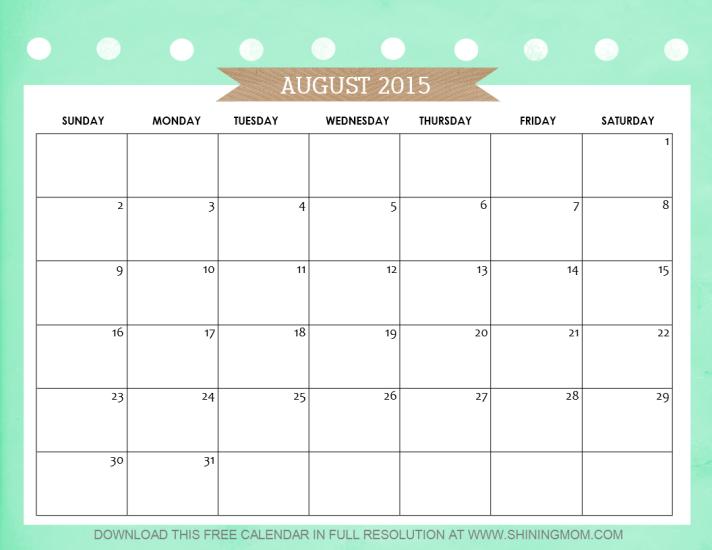 Yup, the title says it, it’s our free printable calendars for August 2015 that I am releasing on the blog! It’s indeed another wonderful morning of sharing, isn’t it? 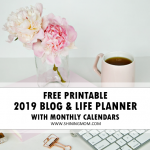 As I’ve told you, sharing my monthly calendar creations never fails to make my heart leap as I know some of you are really using them to plan your daily activities for each month. 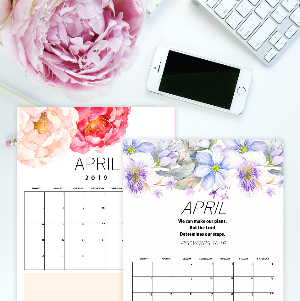 Each time I think that my humble calendars reach your homes and that they somehow contribute in making your days stay organized, I am just so flattered! So here are the calendars then. 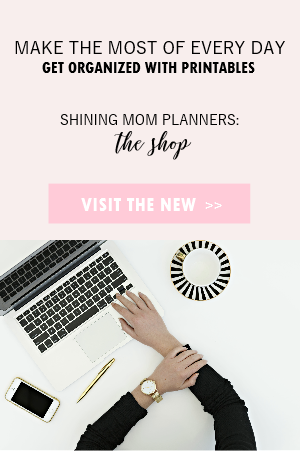 Some are freshly designed while some designs are previously released on the blog. 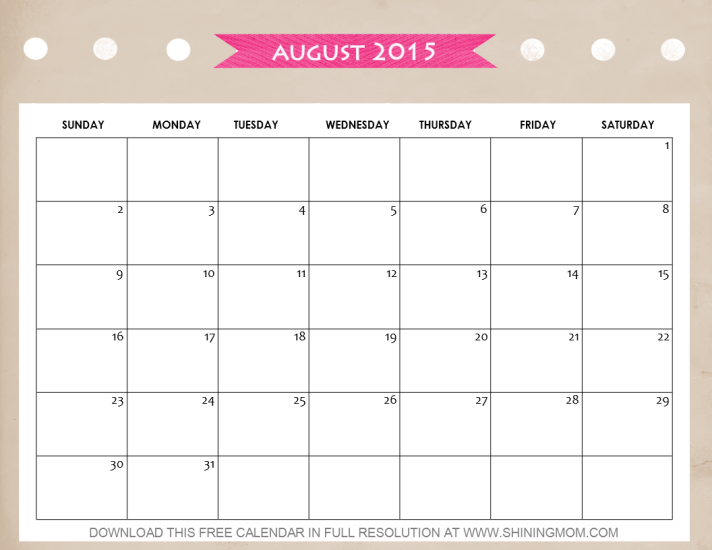 Ready to view and take your pick as the August 2015 calendar design to print? 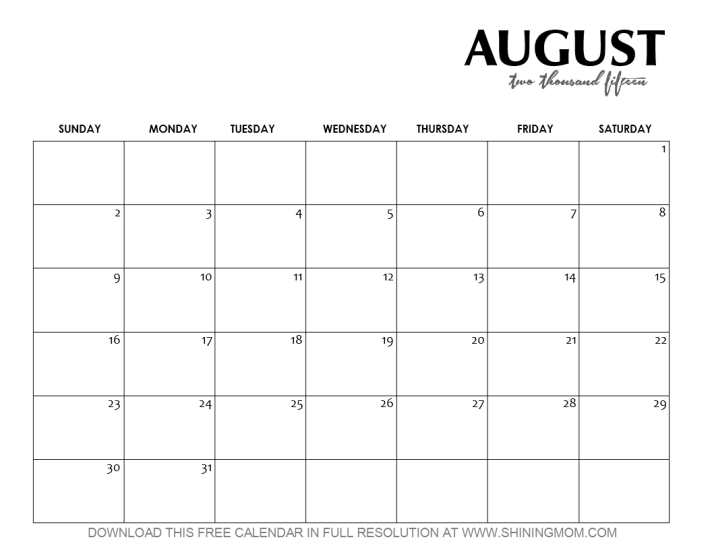 *UPDATE: If you’re here for the 2017 edition of August calendars, get them HERE. * And, oh, would you like to see our twenty seventeen calendars,too? Get them HERE! For this set, I am starting off with my favorite. 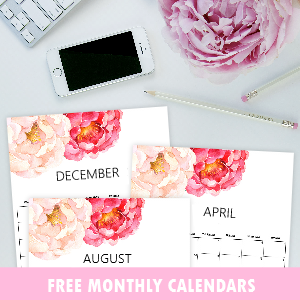 This free printable calendar is a new design. I love how the blending of colors turned out! 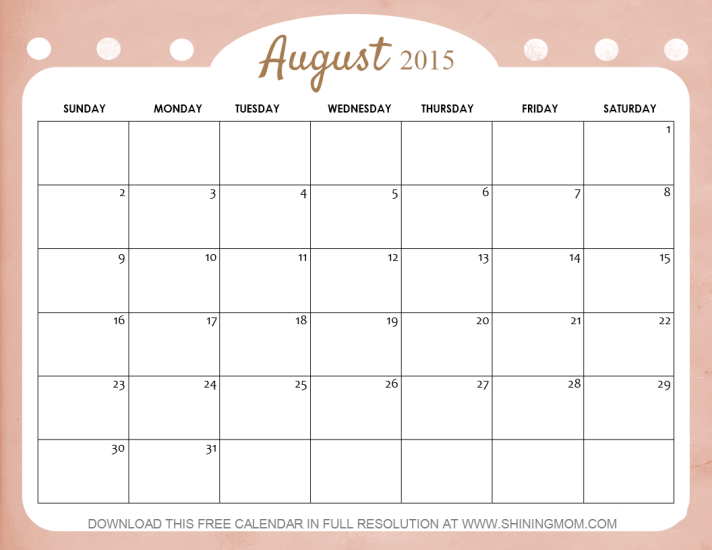 I find the lettering for August is pretty as well! And since this calendar is so feminine, this is for all the moms and ladies out there! I find our next design cute. How about you? I just love that shade of blue matched with that pretty brown ribbon! Who here loves pink? 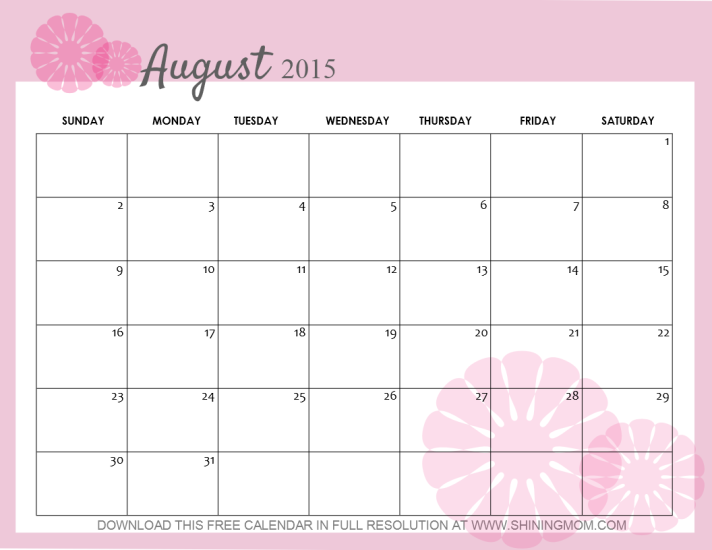 Here’s another pretty August calendar designed with the little girls in mind. 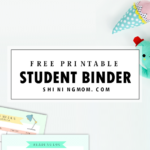 I think this is going to be great to keep with their school binders! And oh, there’s a special space for them to write down important reminders! I tried to create a blue version of the calendar and I like how it turned out. It looks refreshing, isn’t it? 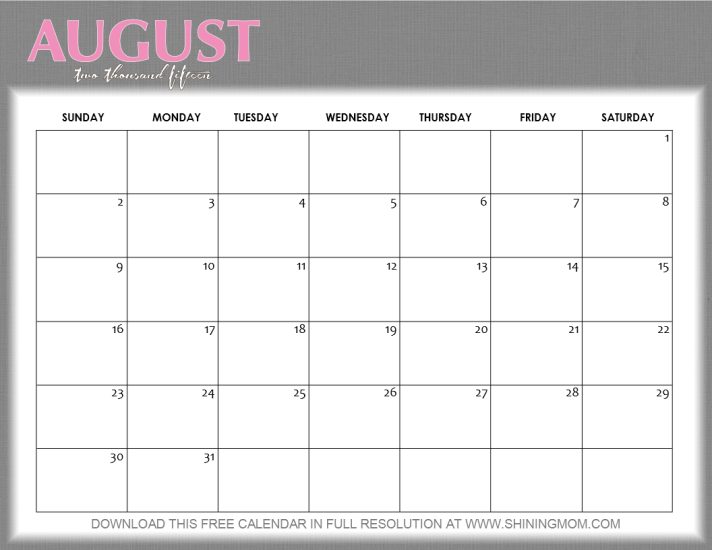 I know some of you like your calendars to be sleek and just plain black and white so here it is! Here’s another simple design that you might like to use for the month. 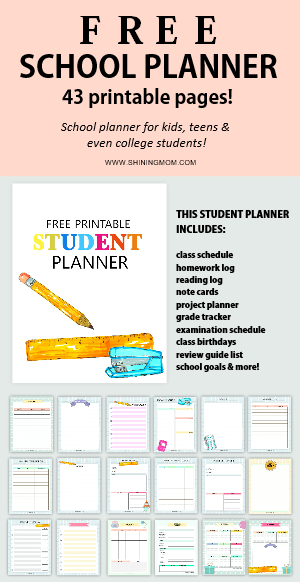 This will be great to place on your work tables! 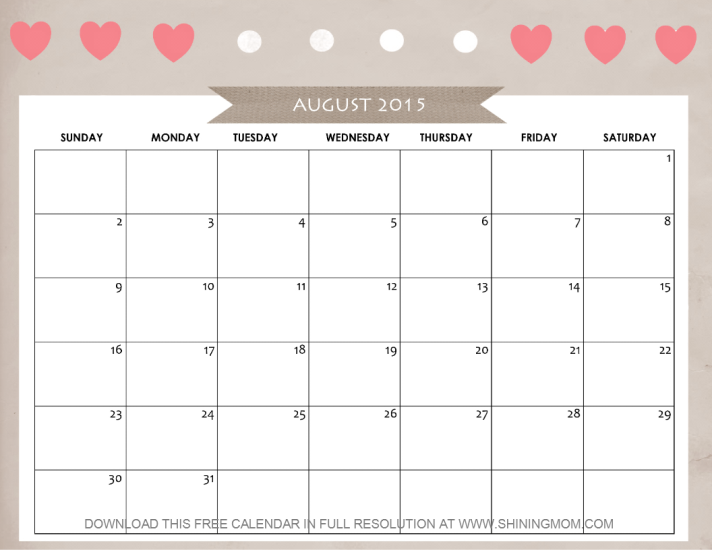 This calendar was particularly requested by a bride-to-be to be released again for this month. 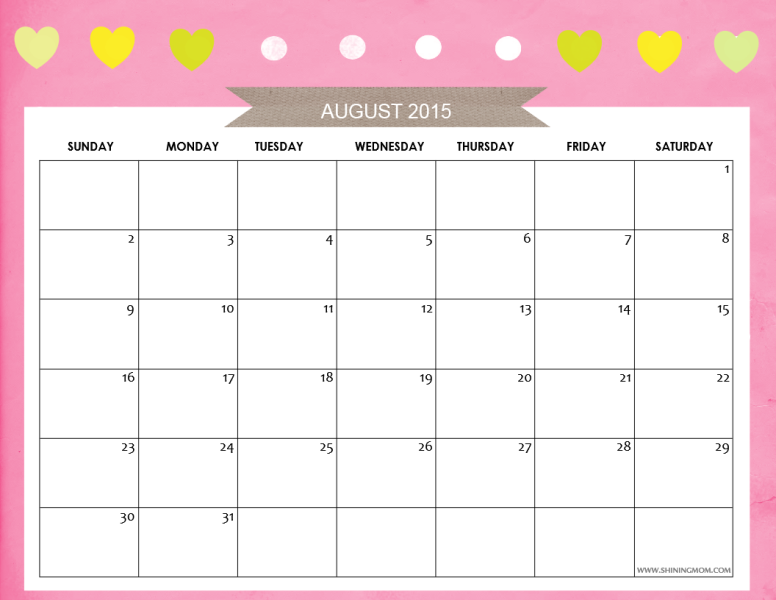 She said she’s using this calendar to plan he big day ahead. I felt so great reading her email, and I’m so glad that she loves this design! Look at those pretty flowers! This next calendar in the set is definitely pretty, do you agree? 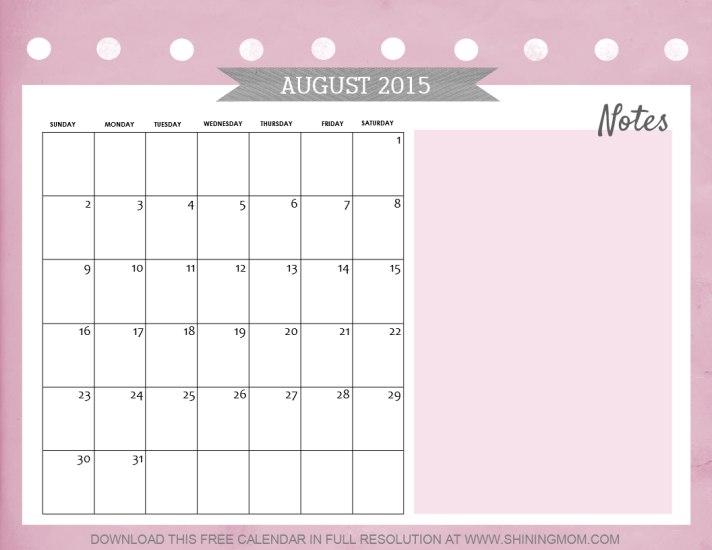 Here’s another calendar design option! How do you find it? 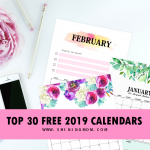 Please note that all of the calendars released in this post are designed to be printed on a letter-sized paper (8.5×11). 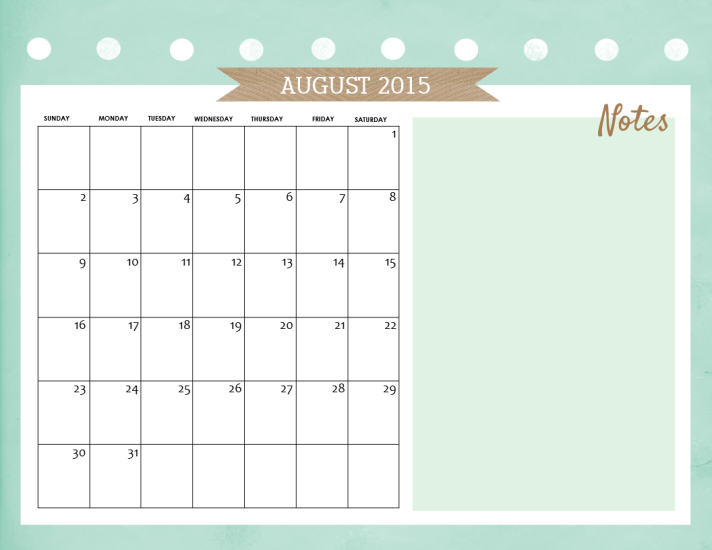 What’s great about these calendars is that you’ve got spaces for you to write your notes! Do make sure to set your printer in High Resolution setting to get the exact colors of the design! 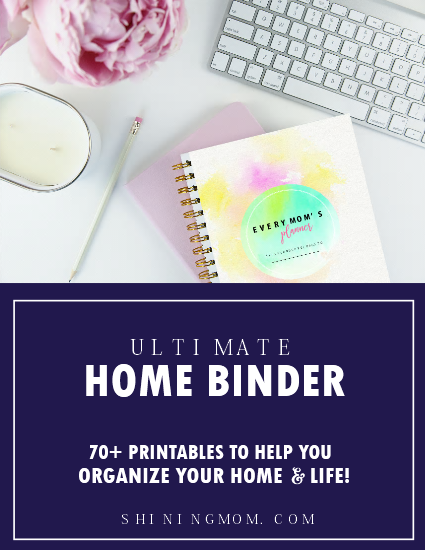 To make downloading easier for you, I’ve created the file in PDF format that can be downloaded instantly. Worry not, the looong footer is not found in the copies you’ll be getting! Ready to get your calendars? 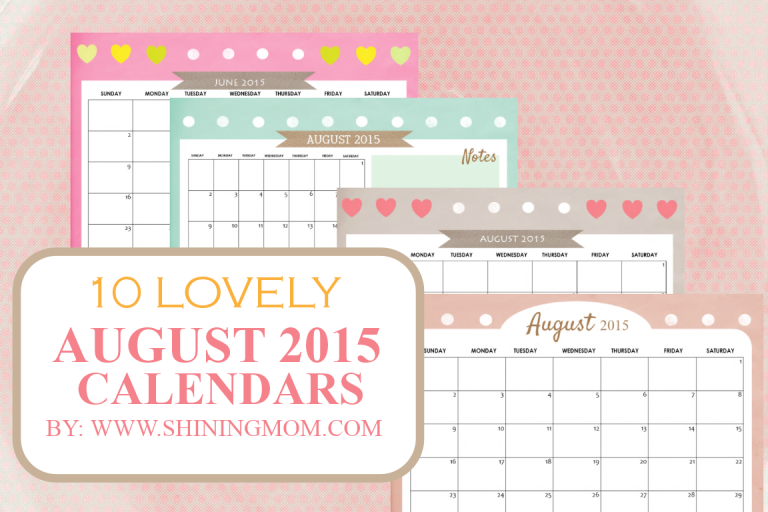 They’re here: August 2015 Calendars by ShiningMom blog. Have you seen our twenty seventeen calendars,too? Get them HERE! 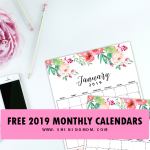 The calendars published are free to use for personal use only. 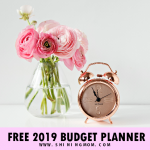 I’ll be happy if you could tell others about these freebies but only the topmost photo in this post can be used and please remember to link back to www.shiningmom.com, NOT to the pdf files directly. Thank you. 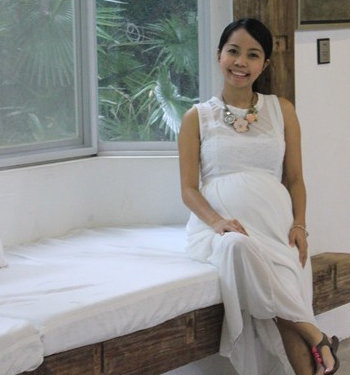 « Olay Regenerist #MiracleDuo is now in the Philippines! Awww! How could I miss that! It has been repaired. Thanks for the heads up!